Imagine a super cheap laptop project that could be fine for reading ebooks, writing documents and searching for text based stuff on the Internet. Basically a display that could be some type of mobile phone like monochrome LCD display but large enough to be usable in a laptop form factor. That type of cheap monochrome screen and cheap embedded processor could display very basic HTML text-only pages from the Internet. And I could imagine that a whole mobile-web type of alternate Internet could be made that would suit to be viewed on this type of super cheap embedded laptop. Google or some other online service can even process the whole web other than AJAC and Flash content to reformat it to be displayed on such a supposed low resolution monochrome display. This is the idea of India's "$10 laptop", the Sakshat. Even though about 500 blogs around the Internet had been announcing this as an OLPC alternative, I'd rather call it a complete redefinition of the PC/Laptop industry. India's Ministry of Human Resource Development (MHRD) talked about a February 3rd release event happening through the National Mission on Education through Information and Communication Technologies. The so-called laptop actually turned out to be a storage device containing megabytes of data info which can be accessed by a user by connecting this device to a laptop. It meant that unlike the internet, this device can display that information that has already been stored. Although I agree with the principal that we need to build educational laptops cheaper than the XO-1, they need to be based on cheaper embedded processors, these laptops need to use the cheapest displays that we can get. Even if those displays are low resolution and monochrome. Color displays, the next Pixel Qi and all that is fascinating and we all cannot wait for the XO-2 touchscreens. Though until Pixel Qi launches their first commercial screens hopefully within a few months, until then, then why not use cheap monochrome ones if somehow they can be made to display the kind of text that is needed? Keep current on new XO-2 ideas, subscribe to OLPC News via RSS Feed, Emails or Twitter. A $10 (or $20) e-book / PDA actually sounds like a good idea. 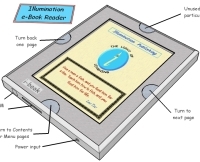 Since OLPC was supposed to be a great vehicle to distribute yet to be released educational content, and ebooks, a device like this could do it for substantially less. A device like this would be less desirable to thieves, and presumably dead simple to use. OLPC tries to do too much, where an idea like this could easily focus on core educational goals. If it was halfways decent you could even start selling it as a cheap e-book, and gain volume to help drive down manufacturing cost. It would be a great way to supplement a couple "real" PCs, particularly if it does have wireless, allowing you to sync content. Even if there was no internet connection, you could still store and serve data off of a local server. You could have textbooks, offline version of wikipedia, you could even serve specialized HTML content. You could even load specialized native applications. Look at Palm PDAs, even with a fairly weak processor they can run somewhat complex apps. PDAs also have instant on, and excellent battery life (particularly without a backlight). Could even be an excellent application of e-ink. And if the things frigs up, you can just poke a pin the back to reset. Thanks for the link, Mike, I've updated the post. "Even if those displays are low resolution and monochrome"
Today #1 cost factor is mass production. The first chips(or screens) in the factory cost millions to make, but its a fixed cost, more units sold=less price/unit. So a low resolution and monochrome displays done in thousands, could be more expensive than high resolution and color or grays if they are made in the millions like they are today. That was know by Negroponte, and it was exactly what he tried to do with XO. That is what Asus , Acer ... are doing today. So, a small screen will be the wave of the future? Who can read the small fonts now? According to Wikipedia, it's actually going to be $100. Oh, and get a load of the tiny little display on the link above. Can you imagine trying to read anything on it? There are an infinite number of conceivable solutions for bringing cheap or even free educational information to the millions of people now lacking such. NN and OLPC, along with their various partners and sponsors and donors, have made an excellent attempt with the XO-1. I would like to see more attempts made, with a variety of different strategies and tactics, and by a variety of champions. I am not aware of anyone working on these ideas, but am not much clued in. Whatever happened to Martin Woodhouse?